Facilities: At the equestrian parking there is no running water, pens, or restrooms. There is a picnic table, two benches, and the park replaced the old wooden hitching posts with sturdy silver pipe hitching posts. Restrooms are located in the main areas of the park. A water trough is located at the back of the park off trail loop three, however, in Sept. 2011 this trough was empty and the facet was inaccessible, so there was no water on the trail. There is also no access to the river from the horse trails. Overnight Camping: No equestrian camping is available at the park. The front entrance gate to the park is locked in the evenings, check with park headquarters for exact time. 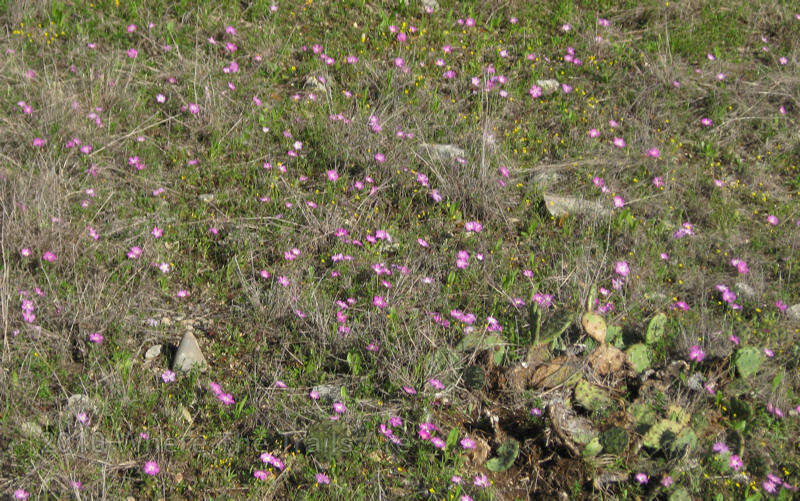 Terrain: The park is very rocky and extremely rocky on the loop 3 trail. Cost: $7 per day paid at the gated entrance headquarters. 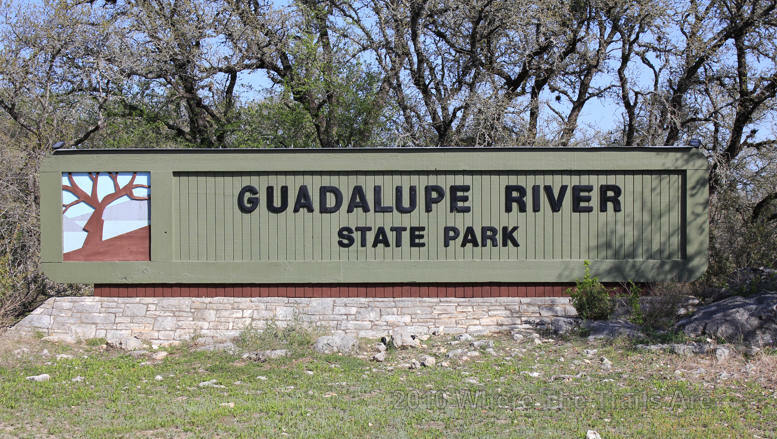 Description: Guadalupe River State Park is located along the boundary of Comal and Kendall Counties. It was acquired by deed from private owners in 1974 and was opened to the public in 1983. 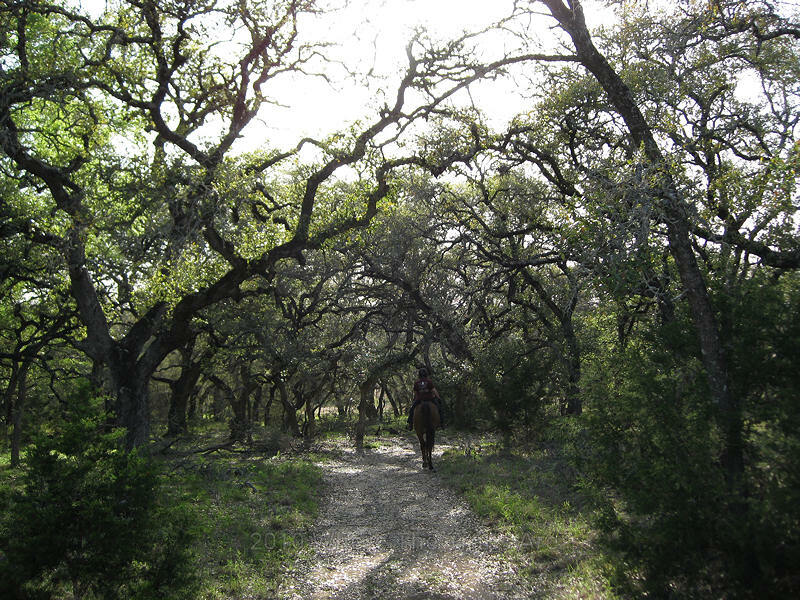 The park is 1938.7-acres of rugged Texas hill country which includes about five miles of equestrian trail shared by bikers and hikers. Upon entering the park there is a gated check station. The park ranger will check your Coggins, collect park fees, and provide you with a map. Restrooms are located at this station but not at the equestrian trail head. The equestrian trail head/parking is an immediate sharp right from the check station/park entrance. The equestrian parking area is primitive with no running water or restrooms. The parking area is of medium size with enough room to maneuver your rig. There is one picnic table, two benches which could be used as mounting blocks, and the park replaced the old wooden hitching post with a strong silver pipe hitching post. The trail begins on the north side of the equestrian parking area. The trails are well marked, easy to follow, and categorized into four loops. 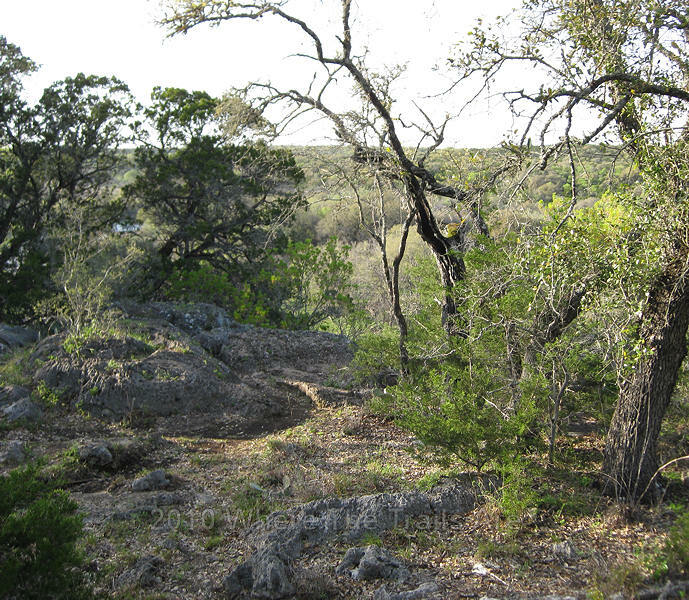 The trails are fairly rugged, very rocky, and wooded. There are few breaks of softer/smoother ground. 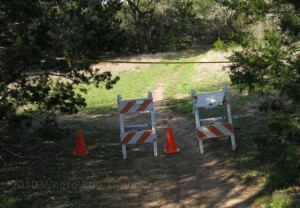 The equestrian trail does not allow access to the Guadalupe river. The only water source on the trail is a trough located on the north side of the Loop 3 trail. However, in Sept. of 2011 this water trough was empty and the facet was inaccessible, so there was no water on the trail. The equestrian trail also does not allow for clear views of the river. Although part of Loop 3 parallels the river the view is mostly blocked by the terrain and woods. 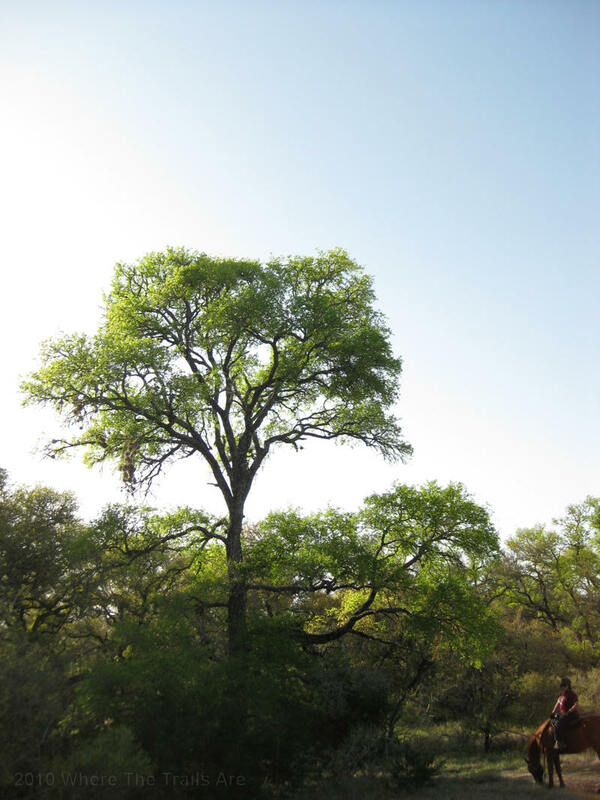 Despite the disappointment of not getting a clear view of the river or access to it, a pleasing visual experience was provided by the rugged Texas hill country, big oaks, and cacti. For trail riders who wish to go a short distance, teach their horse to watch his/her step, and who own a good set of horse boots, or have shoes on their horses, or own a horse with extremely tough hooves this might be an all right trail. 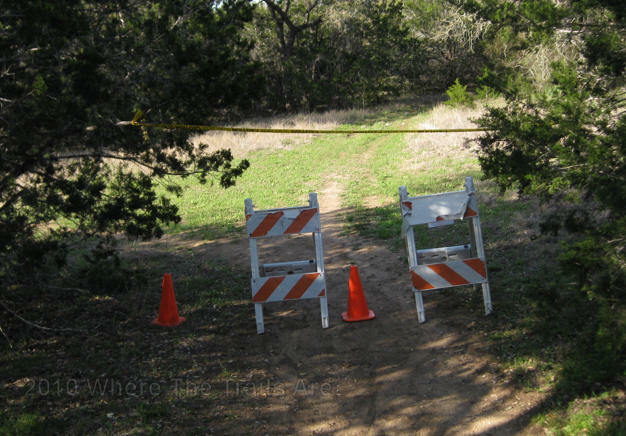 However, for riders who want some distance and don’t want to chance injuring their horse on rough rocks this might not be the right trail for you. Please note on the trail map, Loop 3 where it states rough terrain, they aren’t kidding. Loop 3 rocks, I did not get a shot of the roughest spots. You can see a tiny glimpse of the river between the two trees on the left. I have only been on this trail once and was not overly impressed when considering other trail choices in the area. 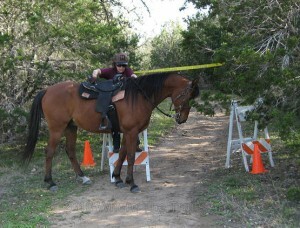 One area of the trail was blocked off with cones, tape, and saw horses. I was impressed when calling headquarters to reach a person (not a recording) and get a quick answer and permission to move or go around the block. She explained they had been doing work on the trail during the week and had not moved it out of the way. It is a comfort when you can reach someone for assistance when on the trail but this information could have been shared with us earlier at check in. I was further impressed and entertained to see Carol use the saw horse as a mounting block to get atop her tall Arabian. There were just a few hikers on the trail and no bikers. Sweet William wild flowers flourished along the trail side and the weather was perfect.